When I get these emails, I usually ask the user about their Malleable C2 profile. Malleable C2 is a technology to change the network and memory indicators for Cobalt Strike’s Beacon payload. In some cases, it can alter the tool’s behavior too. I sometimes get a reply that the operator is using a custom profile derived from one of the Malleable C2 profiles on my Github repository. Inevitably, I’ll learn that the base profile is a profile that uses HTTP GET requests to download tasks from AND send data back to Cobalt Strike’s team server. Cobalt Strike’s Beacon payload downloads tasks from its team server via an HTTP GET (or POST) request. The payload limits itself to 1MB of encrypted data per request. This is enough to download most task packages in one request. By default, Cobalt Strike’s Beacon payload sends data back to Cobalt Strike’s team server with an HTTP POST request. In this default, the Beacon payload embeds its encrypted data into the body of the POST request. Here, the limit is again, 1MB. If you’re downloading a file, Beacon will deliver it in 512KB pieces. This 1MB limit is enough to send a 512KB file piece and some output in one HTTP POST request. The default is what most Cobalt Strike users are used to and it’s the behavior most Cobalt Strike users expect when they use the HTTP and HTTPS Beacon payloads. Cobalt Strike 3.6 extended Malleable C2 to allow operators to change where, in the HTTP request, Beacon embeds data it sends back to the team server. The default is still to embed data into the body of an HTTP POST request. But, you also have the flexibility to embed Beacon’s data into the URI, an HTTP header, or a URI parameter. You can also change the HTTP verb associated with this request too. This is amazing flexibility to put into an operator’s hands. The above flexibility has consequences though. I can stick 1MB of data into the body of an HTTP POST request, no problem. I can’t stick 1MB of data into a URI, an HTTP header, or a URI parameter. That won’t work. What does Cobalt Strike’s Beacon do in these situations? Beacon chunks its output. The chunker will divide any data, destined for the team server, into ~100 byte chunks. Each piece is sent back to the team server in its own HTTP request. This is where the behavior change comes. I can send a 512KB file piece in the body of one HTTP POST request. That same file piece requires over 5,240 HTTP requests when divided into 100 byte chunks. Beacon does not make these HTTP requests in parallel. Rather, it makes one request, and waits for the response. It then makes the second request and waits for its response. This happens until all needed HTTP requests are made. The latency associated with each request is the thing that affects your download speed. If you’ve seen this behavior in your use of Cobalt Strike, I hope this blog post helps clarify why you’re seeing it. Many analysts and automated solutions take advantage of various memory detections to find injected DLLs in memory. Memory detections look at the properties (and content) of processes, threads, and memory to find indicators of malicious activity in the current process. In-memory Evasion is a four-part mini course on the cat and mouse game related to memory detections. This course is for red teams that want to update their tradecraft in this area. It’s also for blue teams that want to understand the red perspective on these techniques. Why do they work in some situations? How is it possible to work around these heuristics in other cases? Part 1 of In-memory Evasion introduces Memory Detections. This lecture walks through the observable properties of Processes, Threads, and Memory with Process Hacker. Common heuristics, the in-memory indicators we want to evade, are covered too. Part 2 of In-memory Evasion goes through A Payload’s Life. This lecture discusses the heuristics in Part 1 and where they interact with actions taken by a representative offense platform (in this case, Cobalt Strike). This lecture makes the case that offense toolsets do strange things, but in some cases, these deviations from normal program behavior are optional. Part 3 of this course discusses Evasion. General tips to avoid the strange behavior these detections find are discussed. This lecture then gets into the meat: options to configure how Cobalt Strike’s Beacon payload lives in memory are explained and demonstrated. This lecture also shows how to conduct an OPSEC review of your configuration prior to action on a target. Finally, this lecture concludes with a discussion on process context and how it influences the amount of suspect actions/indicators an automated solution will allow. Part 4 concludes the course with a brief discussion of Threat Emulation. Cobalt Strike’s flexibility in this area is demonstrated to steer an analyst to believe they’re dealing with a specific real-world actor in a simulated incident. Part 5 is an April 2018 addendum to this course. This video covers the memory-related threat emulation and evasion features in Cobalt Strike 3.11. I’m a big believer that red teams should know the defenses they work with and know how their tools interact with these defenses. The area of memory detections has developed considerably over the past several years. Whether you’re on the red or blue side, I hope you find this perspective helpful. Cobalt Strike 3.10 is now available. This release adds Unicode support to the Beacon payload, introduces a built-in report based on MITRE’s ATT&CK matrix, and performs endodontics on the Beacon payload. One of Cobalt Strike’s limitations is its ham-fisted handling of text. Cobalt Strike treats everything sent to and received from Beacon as binary data. This creates headaches for Cobalt Strike users that come across non-ASCII characters in usernames, passwords, file names and other data. Cobalt Strike 3.10 addresses this problem. Beacon now encodes text input and decodes text output with a character encoding appropriate to the target and situation. The end result is on systems with a Chinese locale, Cobalt Strike will display Chinese output and accept Chinese input. On systems with a Japanese locale, Cobalt Strike will display Japanese output and accept Japanese input. The same goes for other languages. Go to Cobalt Strike -> Preferences -> Cobalt Strike to edit the GUI Font value. This will change the font Cobalt Strike uses throughout its GUI, dialogs, and tables. This option is new in 3.10. Cobalt Strike -> Preferences -> Console and Graph change the fonts used by Cobalt Strike’s console tabs and pivot graph. Cobalt Strike 3.10 integrates The MITRE Corporation’s ATT&CK Matrix into its reporting engine. 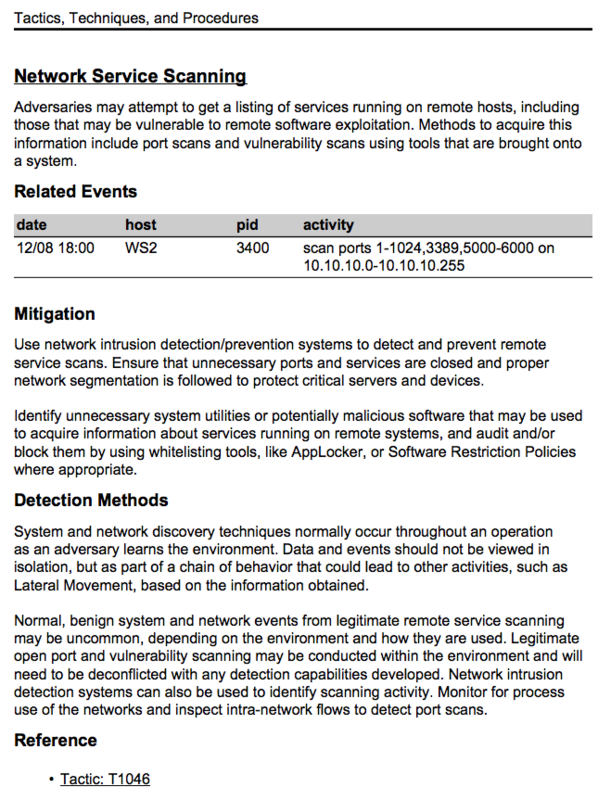 ATT&CK is a project to describe adversary post-exploitation behaviors with their detection and mitigation strategies. Each behavior is assigned a Tactic ID. Cobalt Strike 3.10 associates Beacon actions with one or more ATT&CK tactics. Scripts have the option to do this with the &btask function too. Cobalt Strike uses this information to generate a Tactics, Techniques, and Procedures report. This report presents your Cobalt Strike activity on a tactic-by-tactic basis. Each tactic includes a description, mitigation, and detection narrative. This release took many steps to remove functionality from the Beacon payload and restore that functionality with changes in the Beacon controller. # $0 is the entire command with no parsing. # Build up our entire command line. # task Beacon to run all of this. These changes remove a few unique strings from the Beacon payload. This is where the root canal analogy comes in. A root canal not only removes (signs of) infection, it replaces the infection with something benign. That’s here too! These changes recognize the fact that some analysts use tools driven by YARA rules to detect and identify payloads in an environment. These rules often target unique strings observed by the rule’s creator. Knowing these strings, red teams have an opportunity to deliver more interesting adversary simulations and exercise another aspect of their blue team’s detection and response capability. Check out the release notes to see a full list of what’s new in Cobalt Strike 3.10. Licensed users may use the update program to get the latest. A 21-day Cobalt Strike trial is also available. NOTE: An in-place update of Cobalt Strike with live sessions is never recommended. With Cobalt Strike 3.10, this is especially true. Cobalt Strike 3.10 cannot control sessions from previous versions of Cobalt Strike. Today, SpecterOps announces its acquisition of MINIS LLC. The company is doing its social media thing to spread the word. I wanted to take a moment to share the news and comment on it in my own words. If you want press release language, we have that too. To evaluate an operation, military planners often discuss measures of performance and effectiveness. Performance discusses the technical execution of the operation. How well did the operators adhere to the plan? How skillfully did they carry out the complex tasks asked of them? It’s quite possible to have perfect execution and fail to meet the objective of the operation. That’s why performance is one measure. Effectiveness is the other. Effectiveness is a measure of the success of the operation, overall. In a highly technical role, like adversary simulations, it’s easy to lose ourselves in measures of performance. How many shells did you get? How many findings are there? Did we get DA? How evasive, scary, and cool is our malware? What kind of bypasses did we use? Our community is regularly abuzz with discussion of technical innovations. It’s good stuff. There are too few voices discussing the big picture of red team operations and adversary simulations. How do we do this in a professional, safe, and repeatable way? How do these efforts directly benefit a program? How do we measure this benefit? This is the big picture “measure of effectiveness” stuff. We care about this at SpecterOps. We don’t execute an engagement, write a report, and leave. We care about how to make this work have a lasting impact on our customers. We care about disseminating best practices to all. And, that’s why I’m so excited about the MINIS LLC team joining SpecterOps. Andrew Chiles, Derek Rushing, James Tubberville, and Joe Vest are skilled operators. All spent parts of their career with a Department of Defense red team. Today, they’re an important voice on the big picture topics related to red team operations and adversary simulations. How do we do this in an effective and impactful way? Since MINIS LLC was founded, several firms sought them out to learn tradecraft and sharpen their red team offerings. This opportunity to influence expanded a great deal when James Tubberville and Joe Vest co-authored the SANS Red Teaming and Threat Emulation course. Their course focuses heavily on the big picture topics. MINIS LLC gets “threat emulation” and I’ve always seen them as a key ally, helping to drive these ideas forward. They. Them. Not anymore! Us. I’m very excited to welcome Andrew, Derek, James, and Joe to SpecterOps. You’ve done so much under the MINIS banner. I’m very excited about what we’ll do together. Part 9 of Advanced Threat Tactics covers a lot of my thoughts on evasion. The ideas in that lecture are still relevant, the defenses discussed there didn’t go away! That said, there are other defenses and realities offensive operators must contend with today. This blog post discusses some of these and provides tips for adjusting your operations. I used to describe host evasion as smuggling known bad (your payload and its stager) into memory. The real worry, after that, was egress. If you could get an agent into memory AND establish positive control of it, you were usually safe to operate. Today, things are a little different. It’s no longer enough to control a process on a target and work. You have to think about the process you live in and the actions acceptable from it. notepad.exe (and for that matter, rundll32.exe) has no business phoning home to some controller on the internet. A savvy operator will hide their Beacon in a browser process or an updater for some application (*cough* jupdate.exe *cough*). A successful call out doesn’t mean you’re safe. Some defenders watch for malicious infrastructure indicators. How old is that domain you phone home to? Is that site categorized? Have others from this same organization visited that domain? Techniques like domain fronting help here. Beacon, configured to only use HTTP GETs may look less like a C2 channel (especially when used with domain fronting). Still, a safe channel doesn’t buy you too much. Every process you launch is a risk. Why is cmd.exe a child of firefox.exe? Some defenders have the ability to ask this question. For the operator, the trick is to know your tools. Some commands launch a process. Others don’t. You should favor commands and actions that map to APIs, when possible. If you must launch a process, careful session prepping can help that action blend in. Use the ps command to understand which programs are running. This command maps to an API. Use the ppid [pid] command to request that Beacon spoof the specified PID as the parent process for the programs it runs. explorer.exe is a personal favorite. Use spawnto x86 c:\path\to\program.exe to configure the x86 program Beacon should spawn for its temporary x86 jobs. Many Beacon post-exploitation actions spawn a temporary process, inject a capability into it, retrieve results, and kill the temporary process. spawnto x64 configures the x64 variant of this setting. Pick a plausible program.exe that fits well with your chosen parent process. These steps do a lot to make your new processes (and post-exploitation jobs) blend in with normal activity. The rabbit hole goes deeper though. It’s not enough to work only with APIs. You have to know which APIs are considered unsafe. Process injection stands out as an unsafe action. It’s helpful to know which commands do it and to know their alternatives. For example, I often inject into a remote process to spawn a payload in another desktop session. An alternative is drop an executable to disk and use runu to run that executable as a child to a process in another desktop session. Same effect, except one depends on remote process injection, the other does not. Do you absolutely need to run a Beacon command that injects into something? Inject into your current process. Beacon will treat this situation differently from a remote process injection. Beacon knows to use CreateThread instead of CreateRemoteThread (and other similar functions) in these cases. If you need to discipline yourself to working this way: set the Malleable C2 option create_remote_thread to false. This will disable remote process injection in Beacon. Set hijack_remote_thread to false to disable Beacon’s method of process hollowing for its temporary jobs. Other dangerous actions include any and all use of PowerShell. Once a major boon for offensive operations, PowerShell is now one of the most well instrumented technologies on the Windows platform (We love you Lee). If you depend on PowerShell for your operations, it’s time to brush up on working without it. Many Beacon commands that use PowerShell have simpler primitives that don’t rely on it (e.g., spawnas -> runas, spawnu -> runu, etc.). Some Beacon commands for lateral movement (winrm, wmi, and psexec_psh) use PowerShell too. Don’t don’t limit yourself to these. There are so many options for lateral movement, get creative! Of course, I rely on a lot of PowerShell scripts to automate various offensive tasks. These same things would work well as .NET assemblies too. Payload developers, such as myself, would do well to embrace the use of .NET assemblies in their platforms. #PowerShell IMO is too noisy to remain a "living off the land" technique. The new hotness: .NET assembly loading via insecure methods. All of this assumes you have an agent that safely resides in memory. That’s not a given anymore either. I think of host-based prevention technologies in terms of touchpoints. A traditional anti-virus product might look at my payload when I touch disk or load content in a browser. If I defeat that, I win. Not so today! Now, the battleground is the functions we use to get our payloads into memory. Creating a new thread? Make sure its start address is tied to a loaded module, avoid RWX pages, and for the love of your favorite deity… don’t look like a PE file! My advice to Cobalt Strike users? Ditch stagers, when you can. Their memory OPSEC is terrible. It’s possible to operate stageless with Cobalt Strike. Become familiar with the Malleable PE options I’ve added to Cobalt Strike. These, combined with stageless payloads, can land you in memory in a way that’s OPSEC-safe (in some instances). I also recommend x64 payloads on x64 systems. Functionally, an x86 and x64 Beacon do similar things. In reality, they take different paths to achieve the same results (especially when it comes to things like process injection). Avoid remote process injection. Process hollowing, in some cases, might be OK. Beacon uses a form of process hollowing for its post-ex jobs that depend on temporary processes. And, finally, remember… context matters. An unsigned executable may find itself subject to aggressive hooks and heuristics to detect malicious behavior. A signed executable may receive some extra leeway. An executable signed by a trusted entity may get a free pass altogether. Defenses are evolving and that’s a good thing. As blue TTPs gain ground, it’s on us to adjust our operations and find ways to challenge these TTPs. This is how both sides get better. Kits, Profiles, and Scripts… Oh my! If I had to describe Cobalt Strike in one word, I’d say ‘flexible’. There are a lot of options to control Cobalt Strike’s features and indicators. In this post, I’ll introduce these options, explain the rationale for each, and point you to resources to explore them further. Aggressor Script is Cobalt Strike’s built-in scripting language. It is the preferred way to add features to Cobalt Strike, override existing behaviors (kits take advantage of this), and automate your engagements. Several public scripts add new workflows and features to Cobalt Strike. For example, CACTUS TORCH adds user-driven attack options to Cobalt Strike with x64 and stageless variations too. Tyler Rosonke wrote a script to add persistence options for Beacon. Cobalt Strike also ships with a headless client, agscript, that connects to a team server and hosts an Aggressor Script for you. This client is designed for long-running bots. Common uses of headless Aggressor Scripts is to force DNS beacons to “check in” or notify an operator, via a text or email, that they have a new session. If you’d like to dig deeper into Aggressor Script, jump over to the Aggressor Script documentation. I also regularly post Aggressor Script snippets as Github gists. Finally, Lee Kagan has created an Aggressor Scripts Collection that aggregates many of the publicly available scripts into one place. A kit is source code to a Cobalt Strike feature coupled with a script that forces Cobalt Strike to use your implementation over the built-in one. Kits give you control over the artifacts and processes that deliver the beacon payload. The concept of kits in Cobalt Strike came out of necessity. For a long time, Java Signed Applets and Java Applet exploits were a staple client-side attack option. In January 2013, I implemented Cobalt Strike-native versions of these attacks. The Smart Applet attack bundled several Java exploits into one package. The Java Signed Applet attack hosted a self-signed Java applet on Cobalt Strike’s web server. If a vistor let the applet run, it’d result in code execution for the attacker. While the above options were great, at the time, my users needed an option to modify these attacks to evade detection. This is where the Applet Kit came in. The Applet Kit is the source code to Cobalt Strike’s Java Applet attacks. Included with the Applet Kit is an applet.cna script. When you load this script, Cobalt Strike uses your applet attacks instead of its built-in options. The Applet Kit is available from the Cobalt Strike arsenal. This is a one-page site available to licensed Cobalt Strike users. Go to Help -> Arsenal from Cobalt Strike to reach it. As Java in the browser became more constrained, Cobalt Strike users would often sign the built-in Java Signed Applet attack with their code-signing certificate. The use of a valid code-signing certificate kept this attack alive past its expected expiration date. Introduced in January 2014, the Artifact Kit controls Cobalt Strike’s process to generate executable and DLL files. The contract of the Artifact Kit is simple. 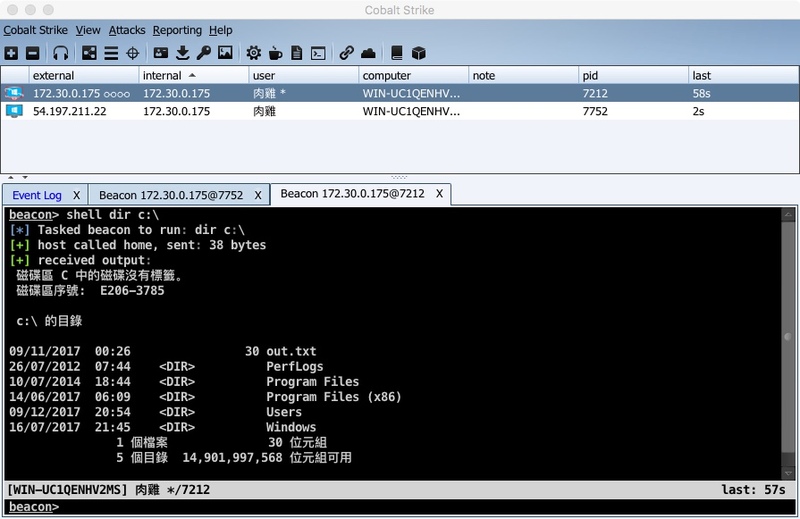 Cobalt Strike provides shellcode and meta-information to a scripted function. The scripted function is responsible for returning an executable or DLL that runs that shellcode. The Artifact Kit is also available from the Cobalt Strike arsenal. The arsenal hosts my implementation of the default artifacts in Cobalt Strike. A few variations are available in the Artifact Kit distribution as well. To use the Artifact Kit: download the default implementation, make changes, build it, and load the artifact.cna script that registers itself to handle executable and DLL file requests in your Cobalt Strike. Many Cobalt Strike attacks and workflows take advantage of PowerShell, Python, and VBA scripts to get the job done. The Resource Kit controls the PowerShell, Python, and VBA script templates in Cobalt Strike. Again, the contract here is simple. Cobalt Strike provides a registered script with shellcode, meta-information, and a description of what it wants. The registered script returns a script that executes the shellcode. The Resource Kit is also available in the Cobalt Strike Arsenal. Many Cobalt Strike users combine the Resource Kit with Invoke-Obfuscation to make Cobalt Strike’s PowerShell scripts much less obvious. It’s a goal of Cobalt Strike to make it easy to combine your team’s “secret sauce” with the toolset. One spot where this comes together well is privilege escalation. Aggressor Script exposes APIs that allow scripts to register privilege escalation exploits with Beacon’s elevate command and Elevate Privileges dialog. The Elevate Kit is a collection of public privilege escalation exploits integrated with Cobalt Strike via these APIs. The Elevate Kit demonstrates how to integrate Reflective DLL implementations of privilege escalation attacks from the Metasploit Framework. It also shows how to repurpose attack POCs implemented in PowerShell as well. The Elevate Kit is hosted on Github. Load the elevate.cna script and you’re ready to go. Don’t be afraid to extend or add to the Elevate Kit. It’s pretty easy. During a recent cyber exercise, I was able to recompile a POC from Github as a Reflective DLL and fire it with Cobalt Strike. The entire process took less than 30 minutes. Cobalt Strike’s built-in reports are designed to convey red team activities and indicators to a blue team training audience. While the built-in reports are serviceable, it’s not well-known that you can write custom reports for Cobalt Strike too. The Aggressor Script documentation covers Custom Reports and hosts the source code for the built-in reports too. I’ve used this feature to generate variations of Cobalt Strike’s built-in reports, split up by IP address ranges, to give tailored information to the blue teams at a large cyber defense exercise. Just generated two ~3,000 page reports merging data from 65 team servers. Wow, the things Cobalt Strike can do. I’ve had quite a few requests for third-party command and control options with Cobalt Strike’s Beacon payload. The External C2 specification (November 2016) was my answer to these requests. External C2 documents how to control Beacon over a named pipe and provides a TCP/IP interface to configure an SMB Beacon stage, receive it, and relay traffic between the SMB Beacon and Cobalt Strike. How this traffic is transported and relayed is up to your imagination. I never announced External C2 as a feature. I wrote the specification, implemented it, and distributed it to customers who requested this feature. I wanted to see what (if anything) these users would do with the specification. The fine folks at Outflank B.V. were the first, that I know of, to build and use an external C2 with Cobalt Strike. They contacted me to share the success story from one of their engagements. They also asked if (and when), they could publish a blog post to share their code and document the feature. This led to the Cobalt Strike over external C2 – beacon home in the most obscure ways post on their blog. Their External C2 uses a corporate file server as a dead drop for communication between a hard-to-reach target and their Beacon controller. Their external_c2 source code is on Github too. Shortly after Outflank’s post, MWR Labs posted their thoughts on External C2 and demonstrated a POC to control Beacon via Office 365 Tasks. In both cases, I’m very impressed and I find these first results encouraging. Needless to say, even though it’s not announced, the External C2 specification is public and is implemented as-described in Cobalt Strike today. Malleable C2 profiles control the indicators and behaviors in the Beacon payload and its stagers. I consider Malleable C2 the most important technology in Cobalt Strike today. I introduced Malleable C2 as part of Cobalt Strike 2.0 (July 2014). The first release of Malleable C2 controlled the indicators in Beacon’s HTTP communication. Malleable C2 made it possible to use Beacon, but look like the havex trojan or something completely innocuous. Today, Malleable C2 isn’t just network traffic. Malleable C2 profiles control which SSL certificate Cobalt Strike uses. Profiles also specify the code-signing certificate used to sign executables and DLLs. Malleable C2 profiles have options to influence Beacon’s memory indicators too. I very much intended Malleable C2 as a threat emulation technology, but it’s much more than that. I didn’t imagine domain fronting when I added Malleable C2 to Cobalt Strike. Yet, when this technique became known, Cobalt Strike was a go-to platform to take advantage of it. Today, I heard about a customer using the string replace feature (for Beacon’s stage) to alter how Beacon runs PowerShell scripts. Again, I wouldn’t have thought of that. The Malleable C2 Profiles Github repository has several example profiles to start with. You can use one of these, but the barrier to making your own “never seen” profile is very low. I recommend reading the Malleable C2 documentation as well. Today, there are few things in Cobalt Strike that users don’t have direct control over. Through these tools you may add to Cobalt Strike’s features, modify behaviors that get in your way, change the files that deliver the Beacon payload, and edit the product’s indicators. As red team needs and tradecraft evolve, this flexibility is how Cobalt Strike keeps pace. Cobalt Strike 3.9 is now available. This release brings several additions to Malleable C2 with an emphasis on staging flexibility. Stagers are tiny programs that download the Beacon payload and pass control to it. Stagers are a way to use a size-constrained attack to deliver a large payload like Beacon. While I recommend working stageless, stagers are helpful in some situations. Wouldn’t it be nice if you could disguise staging to look like something else? That’s possible now. While the HTTP staging gains the most flexibility in this release, 3.9 enhances Malleable C2 in other ways too. The dns_stager_prepend option places a string before the encoded payload stage delivered via DNS TXT records. This offsets the content in this process and pushes back on signatures that target fixed TXT records in Cobalt Strike’s DNS staging process. This release adds an obfuscate setting to the Malleable PE directives. This option masks the Beacon DLL’s import table. Together, the obfuscate setting and strrep (introduced in 3.7), give you a lot of control over which strings are visible in the Beacon stage. And, Malleable C2 gains a mask statement for its data transform blocks. The mask statement generates a random 4-byte value, masks your data with this value, and prepends this 4-byte value to the masked data. This last step makes it possible to reverse the mask step. The mask statement is interpreted and applied with each Beacon transaction. The mask statement makes it possible to randomize parts of your profile. The licensed version of Cobalt Strike 3.9 and later now requires an authorization file to start. The update program, distributed with the Cobalt Strike trial, downloads this authorization file. The authorization file includes your license expiration date and a unique customer ID. Cobalt Strike 3.9 and later embeds this ID into the Beacon payload stage and any stagers generated by Cobalt Strike. This value is the last 4-bytes of the Beacon payload stager. Check out the release notes to see a full list of what’s new in Cobalt Strike 3.9. Licensed users will need to download the 3.9 trial and use the updated update program to get the latest. A 21-day Cobalt Strike trial is also available.